To help set the stage for this special blog post, it seems fitting to start with a great piece of advice given to me by Scott Maxwell, a Mars rover driver at NASA's Jet Propulsion Laboratory: "There will come a time, possibly more than once, but at least once, where you feel like you simply can't go on -- you're too tired, it's too hard. When that happens, go on. You can do it. You can do it." An enormous sense of dedication had already become abundantly clear by the time I sent out an email request to interview the team that drives the rovers on Mars. I received the immediate response of "yes!" at 3:45 a.m. from an enthusiastic Scott Maxwell - who clearly not only loves his job, but also loves sharing it with others. I instantly recognized his name and was eager to see if he was the same engaging "voice of Mars" who I had seen in so many NASA stories. As it turned out, he was not only gracious and helpful in lining up the interview, but he was also passionate about sharing his work with others. After making an entrance up two floors and badge access doors, we were happily greeted by the same Scott who I had pictured, smiling from ear to ear, as well as a room full of rover drivers who he had arranged for me to interview. It was a tremendous surprise and delight, as I looked around the room and instantly recognized a few of the faces from television and various NASA documentaries. Within a matter of minutes, Scott brought us up to speed on a brief history of Mars, the rovers and other expeditions NASA has sent and will send to the Red Planet. It was immediately clear that Scott lives, eats and breathes rover driving. The way he explained the technicalities and details of the Martian missions and rovers with such precision, spot-on memory and passion, made me feel as though I was part of this exclusive group of brilliant individuals. One of the faces in the room I instantly recognized was rover driver Vandi Verma, whose interesting background and childhood story I had seen on television. I remembered how passionate she was about robotics from an early age. When she completed all the schooling and learning she could in her native India, she set her sights on the United States to get the education and experience that would take her to the pinnacle of robotics: working with and driving rovers on Mars. She went through the citizenship process necessary to work for the U.S. government all while earning her Doctorate and pursing top-level robotics research until being hired by JPL for flight operations with the Mars Exploration Rover project. (For a fascinating look at her history, read her bio.) I had no idea I would be lucky enough to interview Vandi, let alone receive a behind-the-scenes tour of what she was working on. She showed us a detailed 3D contour map of the Martian landscape and Husband Hill, a legendary Martian landform for Mars Exploration Rover drivers. She had been re-driving the particularly challenging and difficult terrain of Husband Hill -- which took the Mars rover Spirit a full year to successfully climb in 2005 -- in preparation for the arrival of the rover Opportunity at a similar feature called the Highlands. All the while, Vandi's fingers seemed to navigate the keyboard with lightning speed, entering commands that exposed breathtaking images and grids of the Martian terrain. We were joined by even more legendary rover drivers, and the room was alive with varying generations of drivers and programmers reaching back to the days of NASA's Mars Pathfinder mission. The conversation was in full swing. The moment seemed fitting to ask if the team had ever seen anything strange that made the hair rise on the back of their necks, and if so, what did they do? One of the gentlemen seated at the table wearing a big smile, shorts and a cool Hawaiian shirt, spoke up about a strange event involving what looked like a "white rabbit" on the surface of Mars. I listened intently to John Wright, an engaging and cool dude who used to work at Hughes Aircraft, founded by one of my personal favorite heroes and explorers, Howard Hughes. 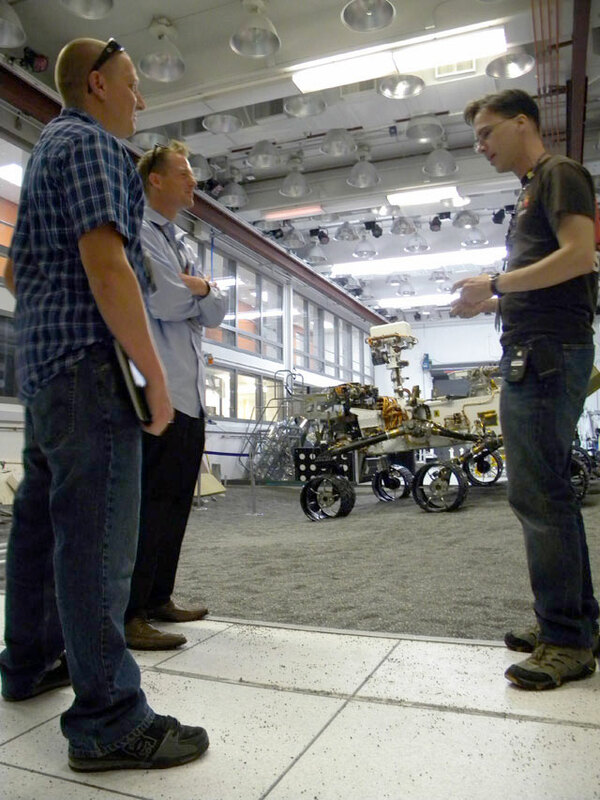 John drove Spirit for six years and is one of the five developers of the software that the rover drivers use to build command sequences and visualize and rehearse the rovers' activities. He tells great stories, including this one about the "white rabbit." He said one day an image came through from Spirit showing a feature that looked an awful lot like a white rabbit in the distance, and in the preceding pictures, it was gone! The group immediately called up a team of engineers and scientists to examine the finding. It was later concluded that the "white rabbit" was simply a small piece of fabric from the rover's atmospheric descent landing bags that had blown past in the wind. It was a story and lesson that the whole team could relate to with many adding that they feel as though they've earned a degree in geology because they can now quickly identify rocks or anomalies, know what to steer clear of and avoid, and what to investigate. We said goodbye to Chris and Vandi as they were late for a meeting, which I could only imagine was highly technical and dealt with strategically planning future movements for billion-dollar spacecraft. We were then joined by two more rover drivers coming straight from the driving room. It seemed that once again, Scott had gone a step above in rallying all the troops for this interview, and I couldn't seem to stop smiling. Paolo Bellutta and Khaled Ali wcgere just as charismatic and enthusiastic as the rest of the team, and instantly, they started sharing stories that had us on the edge of our seats. Paolo's introduction said it all: "My name is Paolo, and I am from Italy, and please no jokes about driving." The room erupted. What followed was a mesmerizing story about a treacherous navigation next to an 80 meter cliff in Victoria Crater on Mars with Paolo at the helm. Due to the estimations of the terrain combined with the long response time of sending and receiving data and commands between Earth and Mars, there was a period when Paolo had to wait in utter silence wondering if a valuable supplier of otherworldly exploration and knowledge had gone off the radar ... Then, after a grueling two-hour silence, the images and data started to appear again with huge relief. 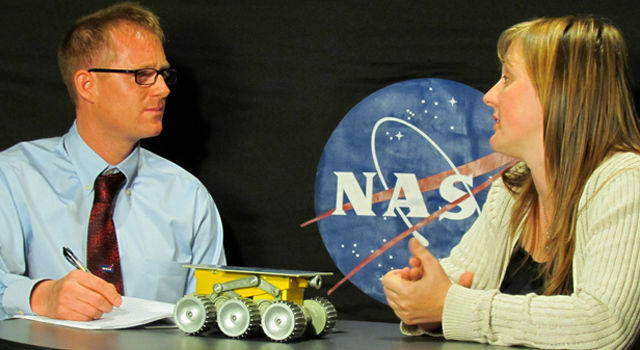 Paolo's story triggered a conversation on safety parameter software programs, which are always evolving and incorporated into rover planning and mission architecture -- usually written and constructed by the drivers and planners themselves. Little did I know that seated at our table, quiet but insightful, was Brian Cooper, who was one of the original software developers and Mars Exploration Rover mission architects. He was also responsible for hiring most of the drivers there with us that day. 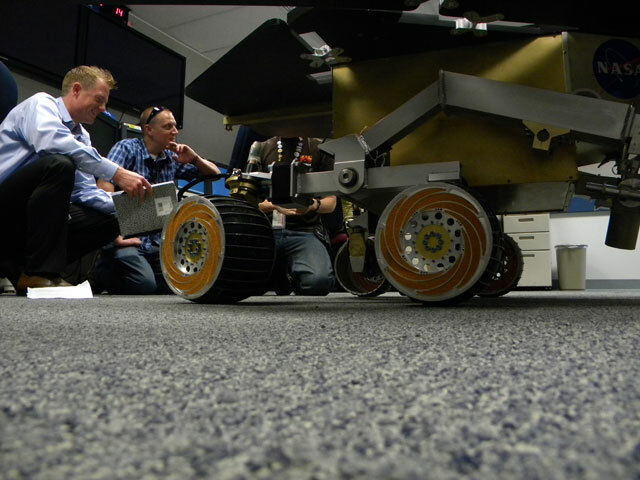 He said that at the beginning of the Mars rover missions, it was difficult to know exactly what terrain and routes were secure and what parameters to observe. But over time, the parameter software development and safety autonomy programs have been getting better and better, incorporating gridlines with built-in "keep-out zones" and danger-sensing abilities. Next, we heard from rover driver Khaled Ali, whose personal background made me want to never stop learning. While listening to Khaled explain how he eventually landed a job as a rover driver, Scott interjected excitedly saying, "Khaled sometimes goes off and takes on other jobs around JPL, such as building test-beds for testing Moonrise, stuff like that. And we always welcome him back with open arms!" This resonates as a prime example of the collaborative, never-stop-learning attitude that seems to be especially prevalent within this team and at JPL. The last of the usual five rover driving meetings per day was about to begin, and Scott suggested we boogie to the command room and catch the tail end of the meeting. As we walked into the room -- "quiet as mice," per Scott's advice -- the first thing I saw was a table laden with coffee, computers, papers and many of the same people that were just in the other room with us discussing various commands and undecipherable software language displayed on a screen up front. 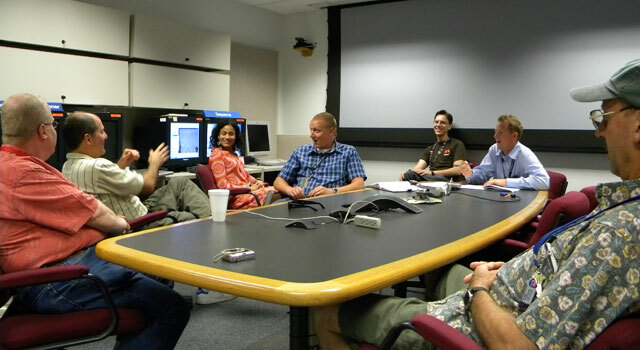 Scott whispered to us that they were reviewing the day's planned movements and trajectory for the rover Opportunity. Every day there are multiple meetings and checks, then double checks, ensuring that the scientific goals, safety parameters and command sequences are exactly on target to provide 100 percent safety and redundancy for the mission. Paolo and John were stationed at computers typing what appeared to my eyes as a foreign language and discussing and answering questions from all angles of the room. We exited the room as it was clear they were in the midst of highly technical planning. And my mentor Jason and I just smile at each other like little kids in a candy store. 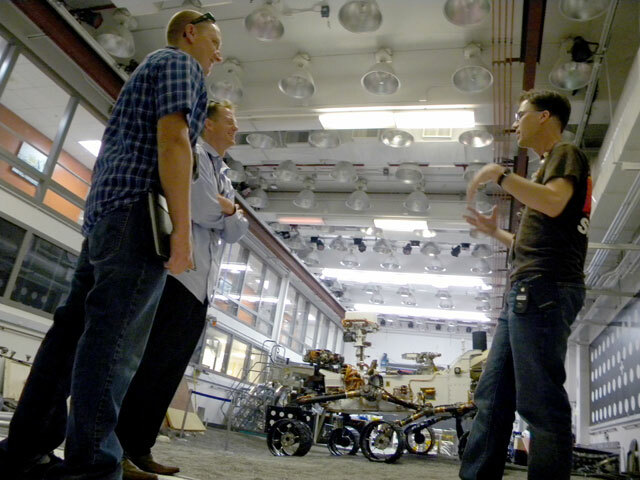 Just when I didn't think my brain could absorb any more, Scott had more adventures and stops planned for us, including another room where Bubba, a full-size replica of a Mars Exploration Rover (like the twin rovers Spirit and Opportunity) was located. Scott gave us such a detailed breakdown of the rover components and functionalities that I felt like a VIP with a backstage pass. Our last stop was the rover testing facility, located in a building specially designed with soil and rocks mimicking Martian terrain and housing full-size, functional rovers. The Planetary Science Summer School group was taking a tour and peering down at the rovers through the glass as we walked in. Within seconds Scott had the full attention of the group and was telling them stories. It wasn't long before he was convincing the whole group to join us downstairs inside the testing room. There was no stopping Scott then, and to the sheer delight of the group, as well as myself, we saw a green light flash on the badge reader and heard the door click open: access granted! Three feet in front of me, in the soil, was where the very engineers, scientists, drivers, and programmers who are responsible for the rovers do their testing! One of the group-members asked Scott what his "Free Spirit!" 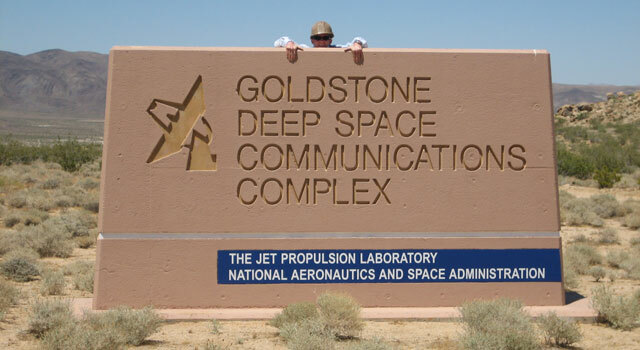 shirt meant and he explained that after six years of what was planned as a three-month mission, Spirit had become trapped in a very fine soil, granular sediment, which is much like powder. And making things more difficult was the fact that only four of her six wheels could help in the exit strategy. After months of testing and brainstorming right in that very room, using those very rovers, they were unable to free Spirit from her Martian trap. She lost her ability to align her solar panels with the sun, and after a long winter, the signal was lost. The loss of Spirit, however, in no way marks the end a continually busy schedule for Scott, Vandi, Chris, Paolo, John, Brian and Khaled. In fact, the team just celebrated the arrival of Spirit's twin rover, Opportunity, at Endeavor crater after a three-year trek across the Red Planet. It's a major milestone for the Mars Exploration Rover mission and one that will continue the Mars rovers' amazing history of discovery. We said goodbye to Scott and expressed our gratitude as best we could. I couldn't help but think that he and his team are some of JPL's most valuable assets, and I blurted it out as Scott crossed the street, like a little kid cheering for his favorite team. He laughed, smiled and swiped his badge, entering another world.